In the history of the garment industry in Hong Kong after WWII, there are two “Smart Shirts” and both had ties to Shanghai. The first “Smart Shirt” (司麥脫) is a popular shirt brand made by Standard Shirts Dyeing, Weaving & Finishing Mills (新光標準內衣染織整理廠, referred to as “Standard Shirts” hereafter), a firm which was originally founded in Shanghai in 1933. It became the top shirt brand in China in the early 1940s and extended its popularity to HK, Taiwan and Southeast Asia in the late 1940s and early 1950s as the principals fled the mainland and set up shops overseas. The other “Smart Shirt” is Smart Shirts Manufacturers Ltd (新馬聯合製衣), a major garment exporter founded in HK in 1956 by Shanghainese entrepreneurs which was acquired by the American textile giant Kellwood and today remains an important player in the global garment supply chain under mainland Chinese ownership. Standard Shirts was founded in 1933 as Standard Shirts Manufactory when its founders saw a business opportunity for locally made shirts due to the boycott of Japanese goods in the aftermath of the Japanese occupation of Manchuria in 1931. The founders included Fu Leung-tsun (傅良駿), his cousin Yu King-lum (俞景琳), K.C. Li (李光炽) and Teng-siao Mao (毛騰霄, hereafter referred to as “T.S. Mao”), who came from different backgrounds. Fu, the head of the firm, was born in Pudong, Shanghai in 1911 and was working as a tram conductor trainee for Compagnie Française de Tramways et d’ Eclairage Electrique de Shanghai (上海法商电车电灯公司) after graduation from the Institut Technique Franco-Chinois de Shanghai (中法工學院) a year before. 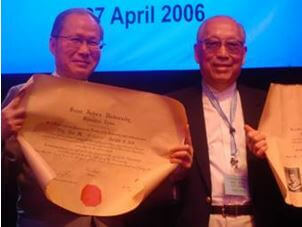 Yu contributed his technical expertise as he had worked for a Japanese shirtmaker in Hongkew, Li was a salesman while Mao, the oldest and most experienced of the four at the age of 40 was the scion of a prominent Fukienese family of admirals and a graduate of the prestigious St John’s University. The initial operation on Avenue Dubail (吕班路) in the French concession started out with 9 workers who made 6 dozen shirts per day using 3 foot pedaled sewing machines and sewing buttons by hand. [i] Even though Japanese shirts were boycotted at the time, foreign made shirts from the US and Europe continued to dominate the Chinese market. The domestic competition was also intense with over 140 shirt factories in Shanghai alone, within which Standard was a small time operation compared to the industry leader China ABC Underwear, which was founded in 1920 by US-trained Thomas Goon Wong (黃鴻鈞) and had 1400 workers. Fu Leung-tsun (right) and Wong Ying (left) with General Li Tsung-jen (centre), the last president of the KMT government in China (who was usually in military uniforms), presumably all wearing Smart Shirt products. By 1940, “Standard Shirt” was available throughout China and also started exporting overseas to Southeast Asia. Although the firm already possessed the technological know-how to make higher end shirts, it still primarily focused on the lower end market since higher end customers continued to favor foreign brands over local brands. As the Sino-Japanese War progressed, imported shirts from the West became more difficult to come by, and after the Pacific War broke out in 1941, they became unavailable in the half of China which was under Japanese control. Against this backdrop and after 6 months of research and development, Standard Shirts created the “Smart Shirt” brand to fill in the gap in the higher end market left by the foreign brands. The first three full page ads in the legendary week day long Smart Shirt advertising campaign in September 1942. Expansion also took place domestically and in October 1946, Fu and Wong came to Hong Kong to explore the possibility of setting up a plant and were welcomed in a reception by the local business community at the Gloucester Hotel in Central. 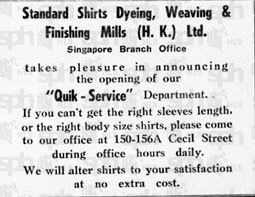 [vi] Between 1945 and 48, branch offices of Standard Shirts were set up in HK, Canton, Hankow, Nanking, Changsha and Taipei. In early 1947, the four leading banks at the time helped finance Standard Shirts’ acquisition of three competing shirt factories and one weaving mill in Shanghai, which increased the group’s production capacity by 80 percent. By 1948, Standard Shirts was the largest shirt manufacturer in the Far East and its Shanghai operations had 2500 workers (one article states as many as 4000) operating 20000 spindles, 1500 looms and 1000 sewing machines with a daily output of 10,000 shirts, which represented over half of the shirt industry in Shanghai. The weaving operation was producing 50,000 yards of fabric per month and the dyeing mill was dyeing 100,000 yards of fabrics per month. As chairman of the newly formed Shanghai Shirt Industry Association, the 36 year old Fu was recognized as the “king of shirts” and the firm’s total assets exceeded US$12 million. 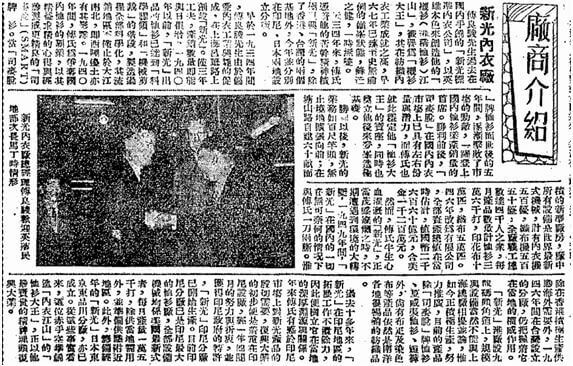 Desperate for much-needed capital to jump-start the industry in Taiwan, the KMT regime in Taipei sent Lei Chen and Hung You-lan to Hong Kong in 1951 to recruit former industrialists from the mainland such as Fu and his friend CY Liu (劉慶一, who operated silk mills in Wuxi and Shanghai) to invest in Taiwan and in 1953, Standard Shirts HK increased its investments in Standard Shirts Taiwan via transfer of equipment and materials while Liu also established Maryland Textile (鴻福紡織) in 1952 in Taiwan which supplied silk yarn to Standard Shirts. [xi] Under the management of T.S. Mao, a modern plant was built in Chung Ho near Taipei which by 1955 was employing around 100 workers with monthly output of over 20,000-30,000 shirts. 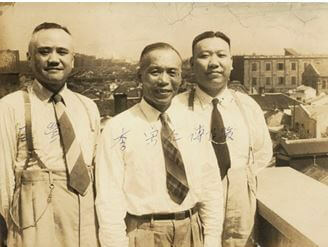 In 1956, Fu and Liu got into trouble in HK when Maryland Textile HK (formed in 1954) was ordered to be wound up. Fu left for Taiwan where he remained involved with Standard Shirts Taiwan although he was no longer the controlling shareholder and was paralyzed due to a stroke. Under the leadership of Shanghainese businessmen P.Y. Chang (張伯英, 1914-1997) and Pai-Hui Hsueh (薛伯輝, 1929-2004) who took over the business in the late 1950s and early 1960s, Standard Shirts Taiwan remained a leading shirt maker in Taiwan with robust domestic sales from its own retail outlets in Taipei and other retailers. T.S. Mao left the firm in 1957 for the US but returned to Asia in 1959 as head of the Far East operations in Singapore for Cluett Peabody, the American maker of Arrow shirts. In Hong Kong, Standard Shirts HK was eventually dissolved in 1963. Back in Shanghai, Standard Shirts went through a number of re-organizations and eventually became part of the Shanghai Garment Group (上海服装集团). Today, its “Shanghai Shirt” brand remains popular and was worn by the Chinese delegation at the 1992 Barcelona Olympics. Just as Standard Shirts and its Smart Shirt brand faded away from the Hong Kong scene, a firm by the name of Smart Shirts, formed also by Shanghainese businessmen, emerged with a very different business model – private label garment manufacturing for clients in the West. 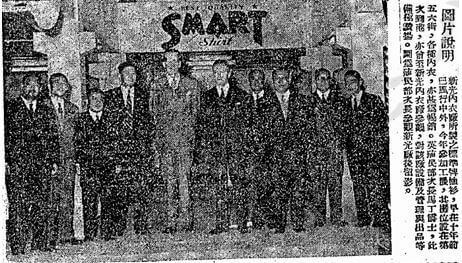 In April 1956, Smart Shirts Manufacturers Limited (新馬聯合製衣) was incorporated with HK$100,000 in paid up capital and offices at the Bank of China Building. [xiv] The three directors of the firm listed at incorporation were Ma Chung-tat (馬仲達, 1907-1999), a leading exporter in old Shanghai whose brother was the comprador of Unilever [xv]; William TL Yao (姚祖亮, 1922-1979) who ran the show and Wong Kam-tim (黃錦添) who supervised finance. Given the timing and the name, it is possible that Smart Shirts took over the HK manufacturing operations of Standard Shirts. The business grew rapidly as the demand for HK made garments in US and Europe was strong and by the end of the 1960s, the firm had 3000 workers working in a 250,000 square feet new factory in 206-208 Choi Hung Road in Sun Po Kong and exported 1.6 million dozens pieces of garments with 3 garment factories and 1 subsidiary. In January 1970, Smart Shirts Limited (the holding company for all related subsidiaries) went public selling 25% of its shares in an IPO arranged by Jardine. [xvi] The chairman of the firm at listing was Y.C. Pei (裴延九) a banker associated with the China & South Sea Bank and Jeff Hu (胡格非), a son of the Bank’s founder was also a Smart Shirt director. After the listing, Smart Shirts continued to grow and moved its manufacturing operations to a larger building (Smart Shirt Factory Building) on 55 King Yip Street in Kwun Tong in 1976. [xvii] In 1970, Smart Shirts was the first firm in Hong Kong to install Century 100 computers from NCR. By the year 1978, Smart Shirts had US$50 million in sales and $3.7 million in net profits. Sadly in January 1979, the firm’s leader William Yao died at the age of 56 [xviii] and in his memory, his family endowed the William TL Yao Memorial Scholarship at the HK Polytechnic Institute of Textile & Clothing. Ying eventually retired from Smart Shirts and moved to Vancouver where he was instrumental in the founding of St John’s College at the University of British Columbia to continue the legacy of his alma mater St John’s University. Today Smart Shirts as a subsidiary of Youngor Group’s Sunrise Textile division remains a leading global supplier of premier shirts and sportswear and operates 20 manufacturing facilities in HK, China, Cambodia, Vietnam and Sri Lanka.